Paul and Joanne would like to welcome you the newly refurbished Cardwell Arms. 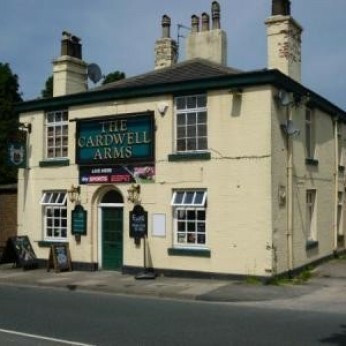 The Cardwell Arms is located in Adlington serving you great quality food and drink.The new and improved menu offers great quality, value for money home-made food seven days a week and will include the pub’s popular Cardwell Arms Challenge, priced at £10, or try our sharing platters and burger bar! We serve weekend breakfasts from 11am - 2pm and our bar snacks are available every day until 8pm! Great new offers are available at the Cardwell Arms with our coffee club card and our Thursday loyalty club card where you can buy 7 pints and get the 8th free! The Cardwell Arms was recently refurbished to a very high standard. We have a fantastic range of draught lagers, bitters and ciders. We are especially proud of our range of Cask Ales. We host a varied range of weekly events at the Cardwell Arms from pool nights, Sunday beer raffles and live entertainment! View the up and coming events at the Cardwell Arms. Watch Live Sport at the Cardwell Arms too with many of the Big Sporting events screened!